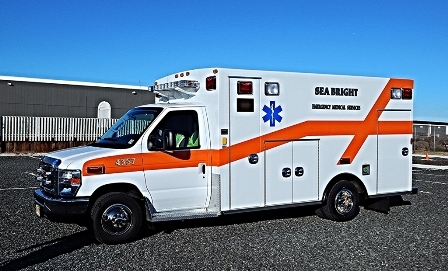 The Sea Bright Emergency Medical Services (EMS) Squad, incorporated in 1936, is an totally independent, all-volunteer organization that provides emergency medical services to Sea Bright and surrounding communities as needed. The EMS squad is a completely volunteer organization existing entirely on donations and is a legal 501 C 3 organization. Squad members are local residents – we are your neighbors. In addition to emergency medical responses, we provide stand-by coverage for local events, such as the annual fireworks display, local athletic races and games, and other community events. We respond to approximately 400 calls per year, and our services are always free of charge. When a resident or visitor of Sea Bright calls 911 or the Sea Bright Police Department for a medical emergency, we are the ones who respond, 24 hours a day, 7 days a week, 365 days of the year. We provide residents with basic life support (BLS) medical services and ambulance transportation to local hospitals. If an illness or injury is life threatening, advanced life support (ALS) is also provided by certified paramedics. When you call 911, the call is answered by the Monmouth County Dispatch System, which contacts the Sea Bright Police dispatcher, who in turn alerts the Sea Bright Emergency Medical Services Squad. In cases of potentially life threatening illnesses or injuries, paramedics from MONOC are also simultaneously dispatched and provide advanced life support. The Sea Bright EMS Squad members carry pagers that alert them to the nature and location of the call. With the exception of first line EMS officers, the EMS squad members who are available meet at the Squad building and go to the location of the call via ambulance, arriving at the scene within minutes. The Squad meets on the second Monday evening of each month and membership is open to all. The Squad sponsors a Cadet group for any one between the ages of 16 and 18. It also pays for all related training for members.